Balls: - Are generally used in applications where metallic balls would not be suitable, and the properties of the sapphire are more favourable. They are also used in fibre optics and optical apparatus. Typical applications: - Probe tips for CMM's, Valves, Bearings, Fibre optic connectors, Optical devices, Bar code readers, Flow meters, Wear applications. 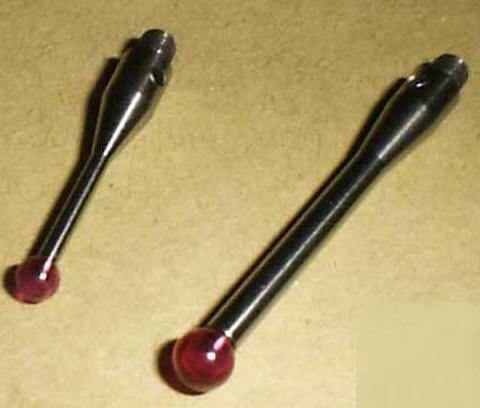 The photographs on either side show sapphire balls used as tips for inspection probes. 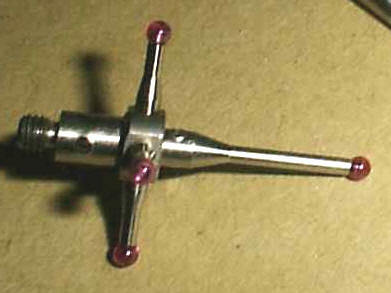 These probes are used on Computerised Measuring Machines (CMM's) and for in-process gauging of manufactured components on Computerised Numerical Control (CNC) machines.